We specialise in providing SaaS based custom solutions to unique problems and processes that your business faces. If you have a unique idea for improving your business software systems, we'd love to talk to you about implementing it. When things seem clunky, slow or inadequate, we can step in to improve the experience. Our flagship product, which shares our company name, is MyClient Portal. MyClient Portal draws together data from various systems and presents them in a unified interface, adding the ability to search, manipulate and export the data with great efficiency. The portal is accessible by staff, customers, partners and resellers; all of whom have specific privileges to access and update the information that matters to them. MyClient Portal unifies your businesses systems, bringing together all the disconnected parts, delivering a complete customer lifecycle management. 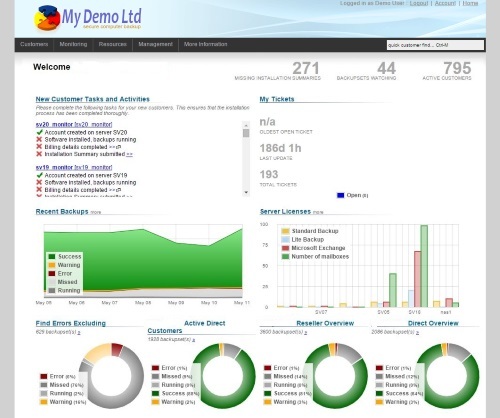 MyClient Portal at present is widely used in the online computer backup sector with hundreds of companies relying on MyClient Portal to provide a platform with monitoring and client services to over 50,000 user accounts globally. Our Portal has also been translated into 9 different languages and used in over 25 countries and currently supports some of the largest international computer backup companies.